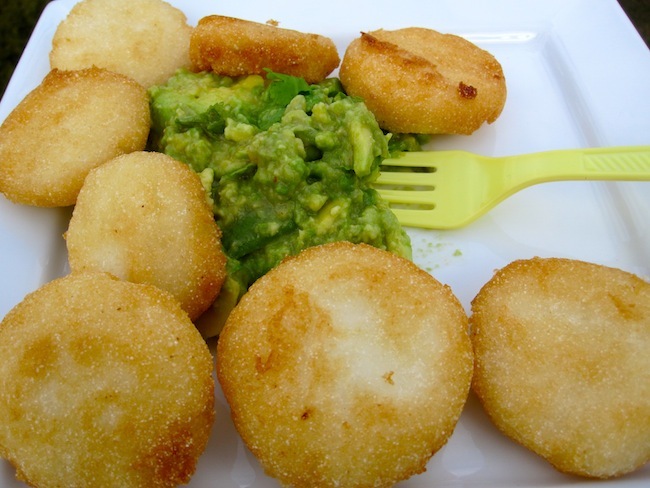 Arepitas Fritas are one of those classic Colombian treats that I just love. Traditional Colombian restaurants serve them as an appetizer with guacamole, hogao, chimichurri and ají or, as a side dish with pollo asado or Roasted chicken. They are a hit at parties, or if you’re alone, a handful along with a glass of refajo makes for a delicious treat! Combine the cornmeal, warm water, cheese, butter and salt, mixing thoroughly. Let mixture stand for five minutes. Knead with your hands for about 3 minutes moistening your hands with water as you work. Form 12 small balls with the dough. Place each ball between your palms, pressing to form a thick patty. Heat oil in a large nonstick skillet over medium heat, then fry arepas in 2 batches, turning over once, until golden, about 3 minutes per side. Drain on paper towels. 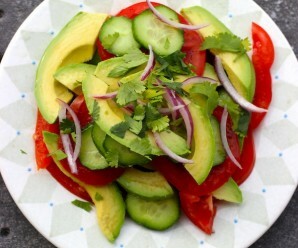 Serve with guacamole, hogao, chimichurri or ají. 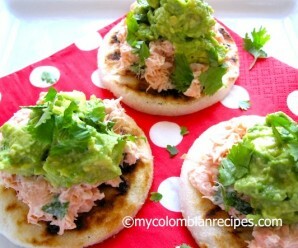 Yummy, how perfect to make an appetizer or snack arepas, and with my favorite…guacamole! I will definitley make these soon! Probably this weekend! Thanks Erica, hope your weekend is a good one! Great Erica! 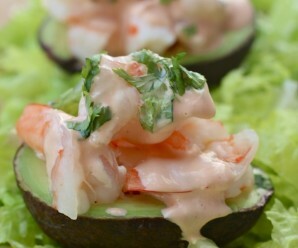 Another sauce restaurants in Colombia are serving with these kind of apetizers is like the one you do for ceviche. Very yummi too! Adriana- Thank you….I am going to try it! Hi Erica. About how much oil did you use? Enough to deep dry them or just enough to brown them on either side? Thanks! Diana- I used about 1/2 cup, enough to brown the arepitas. Wow, these look completely irresistible! 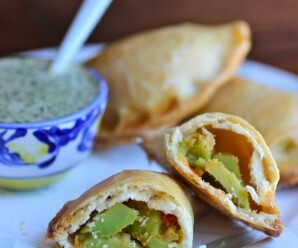 Love them served with the creamy guacamole. erica, my kids loved these for their lunch today!, maybe b-c theyre mini, you know kids love anything mini.. even if they eat arepas every morning this was special for them! although i had to use mozz cheese, but still super good! THANKS!!!! Nicole, My son loves these arepas! Oh yeah! These golden coins sound fantastic. I like the idea of them with chimichurri, yum! I tried these over the weekend, it was a hit – everyone including the kids love them! Deliciosas! yum, erica! 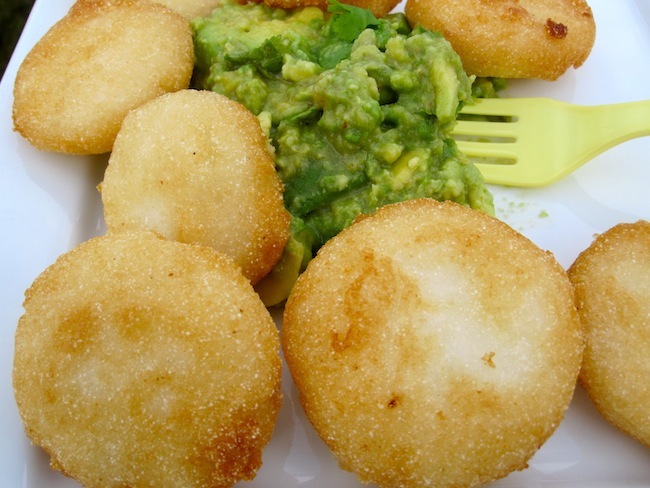 the guacamole is the perfect accompaniment to your little arepas! Do you think these could be made ahead of time and frozen? If so would you bake them before or after frozen. I want to use these for a party—they look delicious! Alisa- I always eat them fresh, but you can try it.